Checkered Zag is a super simple tangle pattern to start the week, and it has more potential than you might imagine at first glance. A relative of the official tangle Knightsbridge, Checkered Zag also bears similarity to Charlie, Cracked and others where the basic line drawing’s alternate spaces are filled with solid black producing the checkerboard effect. As I drew my basic example of this tangle I was wondering “what if I changed the ‘non-zag’ lines of Step 1?”, and here’s my first result. As I said above, this tangle has more potential just lurking in your imagination. 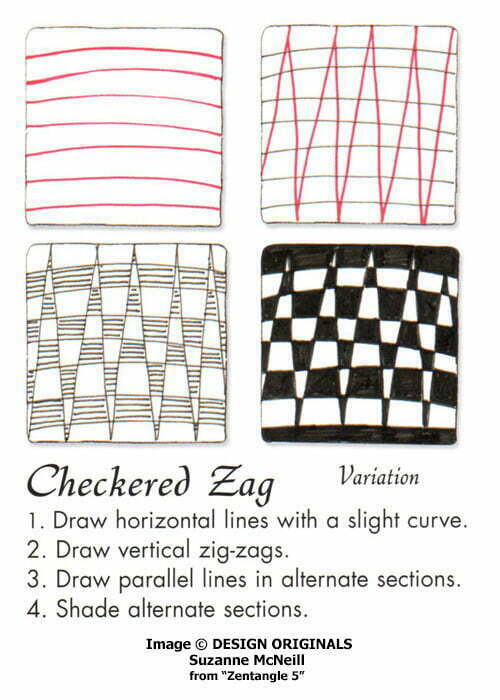 Suzanne illustrates the step-by-step instructions for drawing Checkered Zag here on her blog. UPDATE: Early in the Summer of 2014 Suzanne McNeill’s blog was removed and all the posts and images were lost. The site is being reconstructed as much as possible but the links will no longer be the same. Many of her patterns on TanglePatterns can quite easily be figured out. For those that might be a little more difficult, Suzanne has graciously given me permission to post her copyright-protected images on TanglePatterns for your convenience. The last two patterns by Suzanne McNeill I have not been able to see(Tadpoles and Checkered Zag). Is there some other way to see these patterns? Try using another browser like FireFox, it’s free and rarely has the security and other issues IE has. Suzanne occasionally posts the wrong kind of image for the web and Internet Explorer and some other browsers don’t recognize the format so they can’t display it. You could also leave a comment for Suzanne to let her know. There’s another CZT’s site that gives me problems (can’t recall which at the moment) and I always have to View Source, search for the .png file, copy the link, then Save As to my hard drive. For this one, all that came up was a red X. However, when I did a google search for “Checkered Zag”, and selected the Images category (link below), the second image that pops up is the one on Suzanne’s site. It’s a pain, but it’s a workaround.